Contrary to what you may have heard, SE Asia (and much of the third world, for that matter) is quite a safe place. Violent crime is virtually unheard of outside the large cities, in the lands of hospitality, graciousness and smiles for which the people are known. This does not mean that you shouldn't take precautions, but I think you'll find that your level of paranoia and on-guard caution will drop substantially after several months in the region. To get a general feel for "official" safety concerns for any country in the world prior to departure, check out the U.S. State Department’s travel advisory pages and consular information sheets (travel.state.gov). At first glance you may be scared off and never want to leave the US again, but remember that most state-level warnings are issued because of isolated incidents or politics. The situation for an independent traveler can be quite different. For more relevant information from people who have been in your shoes recently, post a note on Lonely Planet’s Thorn Tree (www.lonelyplanet.com) inquiring about safety in places you’d like to visit. As with any brave venture, you need to use some common sense when traveling. Take responsibility for your own safety. Don’t trust anyone to take care of you or your stuff until you have a good feel for them. Keep your head up at all times, but don’t stress about it. With a little time, traveling safely and smartly will become second nature. Perhaps what most travelers are worried about is being robbed, either in person or back wherever your stuff is being stored. To reduce the possible setbacks of such an incident, DO NOT take valuables with you on your trip. If you buy nice souvenirs, send them home as quickly as possible, if anything so you don't have to lug them around any more (see 7. post & telecommunications). Hopefully you’ve learned by now that traveling lighter = comfort and peace of mind. So now that you have no valuable possessions, you should feel free to explore out on the town without worrying about someone stealing your stuff back at the guest house. Put your camera and guidebook in your shoulder bag and take this along on your daily forays if you're worried about leaving them at the guesthouse. The bag will come in handy for carrying a water bottle as well. If you’re staying in a dorm and no locker is provided, just leave your other things on your bed when you go out. Worried? Do you really care if someone steals your dirty T-shirts, your worn-out sarong, your toothbrush, or even your traveler's checks? If you have a private room, just lock it up and put the key in your pocket, or leave it with the guest house desk man. Again, if someone takes the trouble to bust into your room, they'll be disappointed at their find. Remember, traveler's checks are replaceable, anywhere in the world. I had to replace a traveler's check in Ghana (the bank clerk said my signatures didn't match! ), and I had it the next day. In more modern countries you can replace your checks in a matter of minutes. Of course, your money belt needs to be on you at all times (see also 5. what to bring). As you travel more you may develop your own exceptions to this rule (see below), but initially you should treat it like gold. If you follow the rule of never changing more than $150-200 at a time, you'll never have so much money that your money belt is too bulky to show up under your clothing. Carry small local bills and coins in your front pockets so you don't have to fish into your big stash each time you pay for a plate of rice. Ideally you should carry your money belt inside the waist of your pants, around your abdomen, on your lower leg or even sewn into your clothing, but in practice you may find that you're so comfortable walking around that you just stick the belt in your pocket. The only way someone's going to get your bag and your money belt is if they hold you up with a weapon and search you thoroughly, and I'm personally more worried about this happening in the US than in SE Asia. If traveling solo, you'll spend a lot of time walking alone at night. Use common sense and stay on well-traveled streets. Memorize the street map before you go out so you don't have to fish it out of your bag when you're on the street, looking like a lost, unconfident foreigner. Walk briskly and glance behind you now and then. Basically, act like you know what you're doing, and you'll be more difficult prey for potential thieves or stalkers. Hopefully after you've been in the region for a while, you'll have developed an intuitive sense of trust for people. If you've conversed with a nice man for a while and he invites you over to his family's house, consider doing so. If you're offered food or drink after making a friend at a tea shop, consider accepting. If a nice fellow offers to show you around town because he claims he wants to practice his English, the chances are he's ok. What I'm saying is that these people are friendly, and genuinely interested in learning about you and your country. Don't deny them the opportunity to learn about you, because if you're too skeptical everywhere you turn, why did you come here in the first place? I doubt that you're so narrow minded as to pursue a trip of this scale purely for self-gratification. Besides, as I've said before, meeting locals is the single best way to learn about the customs and cultures of the countries you're visiting. You do, of course, need to beware of con-men. These are guys who use non-violent, smooth talking techniques to swindle you out of your money. They are everywhere that tourists are, but certain countries or regions are notorious for them, notably India, the Middle East and West Africa. Don’t let this scare you off, because con-men are harmless as long as you don’t listen to them. Keep your head up and you shouldn’t have any problems. Common con schemes involve offers of outrageously good money exchange rates, jewelry or gem trading, super cheap rickshaw or taxi rides, non-post office "express" package delivery services to your home country and sleight of hand streetside gambling (in which gullible participants are planted to make winning look easy). Get-rich-quick schemes are always bogus. These things are all avoidable as long as you remember that if it sounds too good to be true, then it probably is. You’d be surprised at how many travelers fall for this stuff. The only solution is to stay level-headed and calm whenever a monetary transaction is taking place. Sometimes you run into very smooth con-artists, and these are who you need to be careful of. Let me offer a personal anecdote: I was strolling down the Mekong in Vientiane when a well dressed man and his wife addressed me in perfect English. They said they were Malaysian and were in Laos on business. Would I like to join them for a drink? "Why not?" I figured. We were chatting away, he gave me contacts in KL to look up when I got down there, and in general I was thinking I had found some nice friends. Would I mind talking with their daughter about university opportunities in America? "Why not?" I figured again. We went back to their guest house and sat down. Sure enough, their daughter was nowhere to be seen, but instead there was another friendly man who started talking to me about card games. He was a dealer at Genting Highlands (popular casino outside of KL), he explained, and asked if I’d like to learn some tricks. "Why not?" I figured again. In a few minutes I’d mastered his sleight of hand tricks and he invited me to become his gambling "partner" when I got down to Malaysia. "We’ll be rich! And nobody will suspect me because I’m the dealer!" he explained. This was starting to sound fishy, so I perked up my guard, but was still willing to go along a little more. Next he told me that a very wealthy Brunei man was coming in just five minutes to play cards with him... why don’t we practice our new tricks to swindle him? My friend stuffed two Franklins in my shirt pocket and everyone started encouraging me, even the wife. "No risk," he said. He was willing to throw away $200 on me! I must admit, it sounds silly, but I considered playing along because it seemed so easy. But then my sensible side fortunately caught the best of me, I wisely refused his money, stood up, and said I had to leave. They all looked disappointed and the wife tried to console me with her sweet voice and offer of another drink, and would I mind just sitting and watching while they played cards? At this point I became adamant and walked out, leaving them staring blankly at my back as I slammed the door on the way out. The moral of the story is, even if you keep your eyes open you can be sucked into bad situations, so whenever any discussion of get-rich-quick comes up you need to bail. 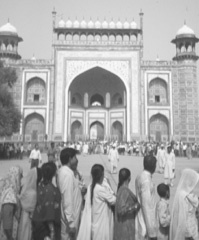 Queuing up for the Taj (India).